Used in 30 recipes at an average of 2.659%. 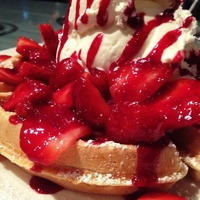 The Apple cinnamion waffle with sweet strawberry sryup drizzled on top !! Multiple fresh Apple's cinnamion waffle with some good sweet strawberry sryup to top it off ! Ripe strawberry and sweet strawberry work great together here at these percentages imo ! And the Fuji works great off the green apple by flavor west here ! With a little Ethyl maltol to sweeten up the waffle ! This all works well for me ! Mix a 70vg 30 pg .. Best after one week.. My apple cinnamon waffle with some strawberry sryup !!!.. Base idea was taken from Wayne's recipe Strawberry icecream cone.I changed a few ingredients to make it taste more like a belgium sugarwaffle than an icecreamcone.Also the ingredients for the icecream are changed. I already made a batch of this last week, did came out really nice after one week of steeping. On the inhale you will taste this typical sugarwaffle that they make here and on the exhale a nice creamy strawberry icecream. Have fun with trying it out and please give me some feedback.